Just like you make over your winter wardrobe when summertime rolls around, you should also give your makeup wardrobe an overhaul, and there are plenty of new summer makeup colors that will give you a fresh update. No matter your typical makeup look, you can revamp your style so that you look current and fresh. By the time summer weather appears you’re probably more than ready to ditch your heavy sweaters, boots and jeans, and you should leave behind dark, dramatic makeup shades as well. While smoky greys, deep plums and navy tones are perfect for winter, the shades look much too harsh in the summer months when you’re dressed more casually and have a golden glow. Summer makeup tends to be light, natural and easy. But where’s the fun in that? 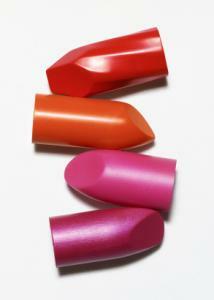 These new summer makeup colors are all about bold brights and punchy hues for eyes, juicy toned lips and bronzed skin. Kick the boring neutrals to the curb and sport bright, ocean-inspired hues on the eyes for an “of the moment” look for summer. Shades of turquoise, sea green and sky blue gives eyes an instant update and leave you looking resort-chic even if you’re spending the summer at home. If you’re hesitant to don a bright blue all over your lid, try using the shade as a liner until you’re more comfortable wearing such bold colors. Just dip an eye liner brush into powder shadow and rim your upper and lower lash lines for the perfect pop of color. If blue isn’t your style, try bright chartreuse, orange or pink, which will look perfect against skin that has a golden glow. With brights on the eyes, it’s best to keep cheeks neutral so you don’t look overdone, but neutral doesn’t mean bare. An ample dose of bronzer applied on the forehead, nose, hair line and cheekbones give you a beach goddess look that screams summer. If it’s daytime or your skin is very oily, opt for a matte bronzer. For a little extra oomph at nighttime try a formula with a golden shimmer to highlight cheekbones. If you’re feeling your complexion looks a bit monotone after you’ve bronzed, add a small sweep of a soft pink blush on the apples of your cheeks for a natural flush that won’t compete with eyes. Pretty punchy hues that give lips that just bitten look are perfect for summer. Peachy pinks, corals and fuchsia shades gives lips an instant update and look gorgeous against a tan. If you’re doing brights on the eyes, keep lips more neutral with soft, glossy peach hues, but if you’re opting to forgo bold lids, amp up your lips with a rich fuchsia pink. Stick to lipsticks with a creamy, slightly shiny finish and ditch matte hues, which look too dry and harsh in warm weather. While trends come and go, there are a few summer makeup looks that always stand the test of time. Shimmery bronze hues on the eyes are always appropriate for summer because they’re neutral, but still bold enough to be fun and flirty. If you’re super fair and bronze feels too harsh against your complexion, opt for gold or copper shades for a gilded lid look. Peach cheeks always look fresh for summer and are a welcome change from the berry shades you probably dusted on during the winter months. Peach looks perfect on all skin tones – from porcelain to caramel, but if you’re more deep espresso, opt for a more orange shade. Cherry hues give your pout that I just ate a popsicle flush and look fresh and juicy for summer. Go for a cherry-hued stain or gloss in lieu of lipstick for a pop of color that lets your lips shine through. There’s something about sunshine and soaring temperatures that make you want to sport new summer makeup colors such as blues, bronze and coral, and luckily these hues are right on trend. Use your imagination to create endless looks – from very bold to soft and sweet. This way, your look is new, but true to your personality.